The bearings taken on the boat are then plotted onto a chart of the Monterey Bay. Students learn how to read and decipher the signs, symbols and measurements on navigational charts. The class includes an introduction to navigational tools such as parallel rulers, globes and the compass rose. The instructor discusses latitude, longitude, basic geometry as it relates to triangulation and other elements of navigation. An overview of the water cycle and watersheds is given. The water sample is tested for pH and the affect of pH on the ecosystem is discussed. Students discuss storm drains and how they relate to ocean pollution. 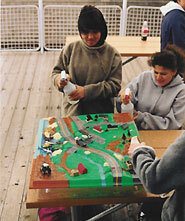 Using a watershed model, examples of point source and non-point source pollution are demonstrated. Students are encouraged to conceptualize solutions to current environmental problems including landfill diversion, organic farming, reducing, reusing, recycling and alternate forms of transportation and energy. The samples from the plankton tow gathered on boat are viewed through a microscope that is connected to a large-screen monitor. Students participate in plankton identification and discuss the different types of phytoplankton and zooplankton collected. A refractometer is used to test water salinity and the results are explained to the class. Instructors discuss factors relating to the variation in salinity and how the food chain can be affected. The instructors lead a final discussion and question and answer session. Follow up activities are provided in the Teacher Packet and follow up information, including the data taken during the program, is available through the Sea Odyssey web site in the Learning Center.